Our wonderful students take time out of their day to help us get ready for our upcoming recruitment event. 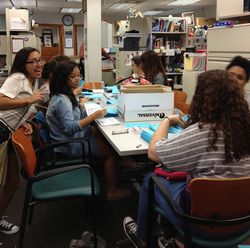 The new Junior class has been great at helping us put all the mailers together. Our Senior class has also given us their support and experience since they also helped last year. During this time the students can earn community service hours and they also get to know each other and work together.